What do three Olympic Trials qualifiers, the American record holder in the beer mile, and the overall male and female winners of CARA’s racing circuit all have in common? They all run for Fleet Feet Sports’ Nike sponsored elite racing team! Chicagoans already know that Fleet Feet Sports is a leader in the field of running shoes and apparel, but we pride ourselves the most on being a community where runners can meet, train together, and have fun doing it. While the racing team is open to athletes of any ability (the more the merrier! ), Fleet Feet Sports created an elite racing team to support local athletes who chase blisteringly fast times while still maintaining full-time careers. In 2017, the roster comprised 26 athletes: these men and women wake up early to hit the lakefront path and grind hard to come out on top of the local racing scene. The 2017 season has proven their efforts to be fruitful; not only did our men and women dominate Chicago races, but many also travelled far to represent our team in other cities in the United States and abroad. The team was out in full force at the season opener: Chicago’s Bank of America Shamrock Shuffle 8k, where the accounting firm Deloitte sponsors team scoring. With a competitive field of elite athletes, including the Brooks Beasts Track Club, and olympians like Alexi Pappas, Kim Conley, and Diego Estrada, the men’s and women’s Fleet Feet teams earned top ranks. The men proved their depth with two full teams placing in the top ten, coming in 7th place (Brendan McDonnell, 24:18, Miz Carrera, 24:42, Lionel Montenegro, 24:47, Chris Robertson, 24:50, and Matt Blume, 24:53) and 8th place (Brandon Mull, 24:53, Damon King, 24:57, Austin Hendrix, 25:03, Niko Jeftich, 25:28, and James Akita, 26:02), while the women’s top team earned 4th place (Chirine Njeim, 28:24, Kelsey Seiler, 28:34, Camille Blackman, 28:46, Pamela Staton, 29:08, and Bess Ritter, 29:53). 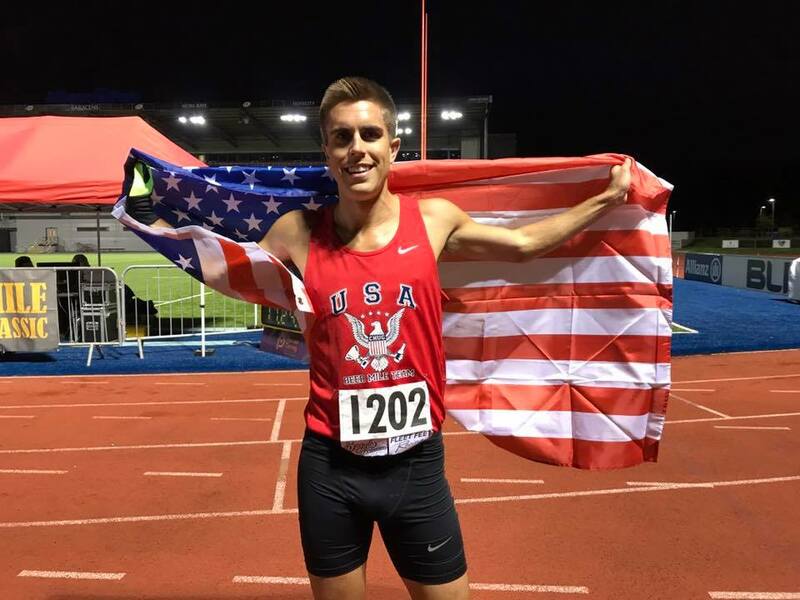 Elite Racing Team member Chris Robertson, representing the United States at the Beer Mile World Classic in London. Image courtesy of Tyler Deniston. In August, Chris Robertson travelled to London to participate in the 2017 Beer Mile World Classic, where he won with a time of 4:52 against elite beer milers from all over the world (that’s chugging FOUR beers of at least 5% ABV and running FOUR times around a 400m track in less than 5 minutes). It was on home turf in Chicago, however, where Chris set the American record for the Beer mile (a casual 4:46.67) at the Wilson avenue public track (you can find a video here). 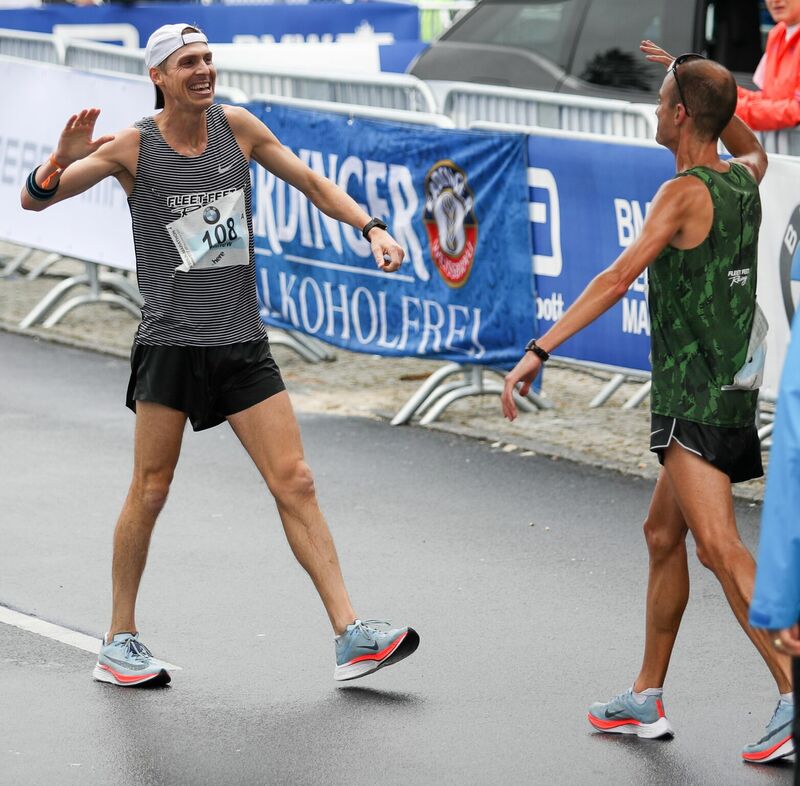 Fleet Feet Sports’ Matt Blume and Brandon Mull during the Berlin Marathon (top), high fiving at the finish line (middle), and embracing (bottom) after hitting the Olympic Trials standard for 2020. Images courtesy of Keith McClure. 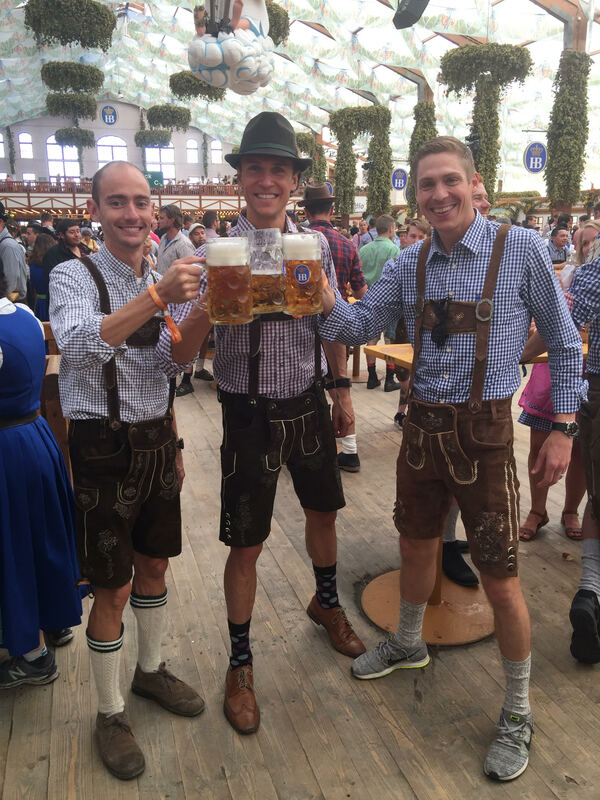 Teammates Brandon Mull, Matt Blume, and Daniel Glaz celebrate their strong showing at the Berlin Marathon with traditional beer and lederhosen. Prost! Image courtesy of Daniel Glaz. Many members of our elite team target major marathons as their peak race for the year, and 2017 brought a bounty of personal records and strong performances. 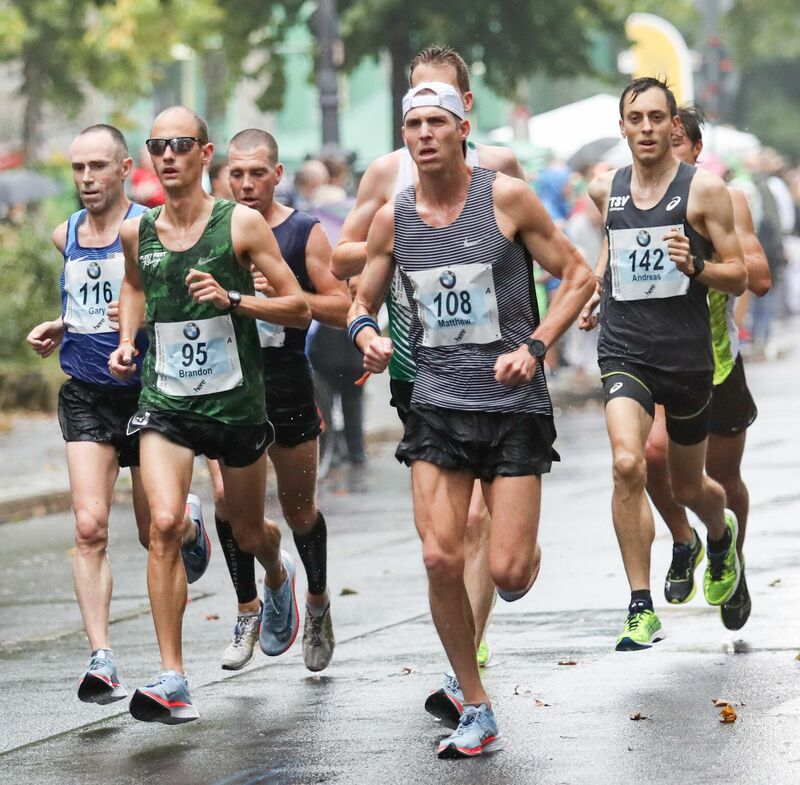 Brandon Mull and Matt Blume punched their tickets to the 2020 Olympic Trials at the Berlin Marathon this September with times of 2:17 and 2:18, respectively. 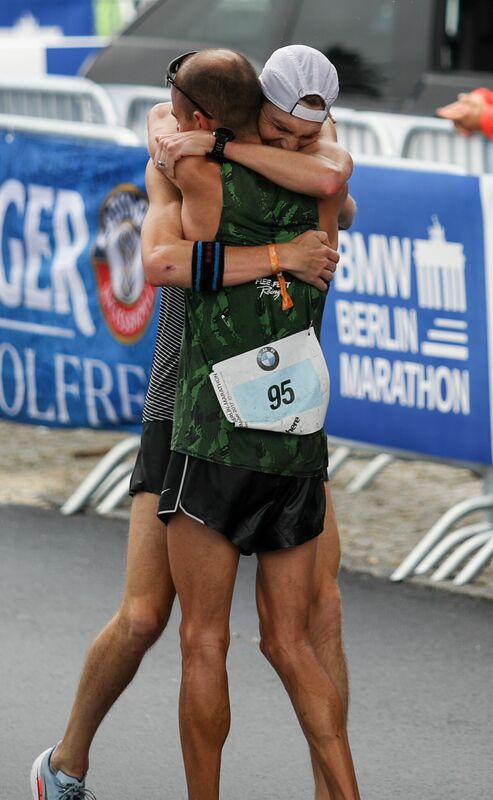 Daniel Glaz also represented Fleet Feet Sports in Berlin, clocking in at 2:23. Glaz also travelled to Japan in February of this year to run in the Tokyo Marathon, finishing in 2:24. Chirine Njeim earned her spot for the 2020 Olympic Trials at the Chicago Marathon with a time of 2:39. Njeim, a native of Lebanon, also travelled to her home country for the Beirut Marathon, where she won with a time of 2:45. 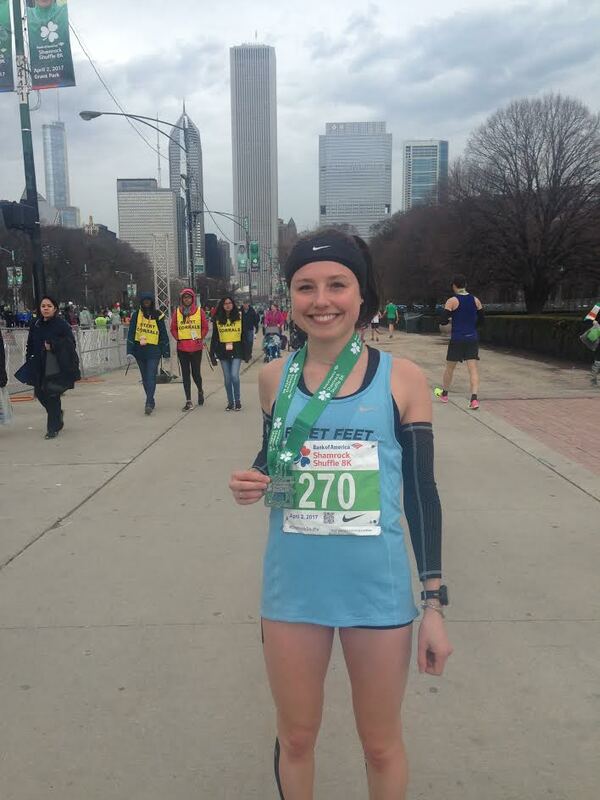 Camille Blackman was the 4th female finisher for Illinois at the Chicago Marathon, running a personal best of 2:48. Niko Jeftich and Cameron Rieger set personal records in Chicago, running 2:23 and 2:28 and coming in 3rd and 9th for Illinois finishers, respectively. Declan McDonnell also represented Fleet Feet Sports at the Chicago Marathon, finishing in 2:33. Damon King set a personal record at the Indy Monumental Marathon, running 2:25. Kyle Larson ran his personal best at the New York City Marathon, running a 2:30. Elite Racing Team member Camille Blackman, who was the 4th Illinois finished at the Bank of Chicago Marathon with a time of 2:48. Image courtesy of Camille Blackman. The Chicago Area Runners Association (known locally as CARA) hosts an annual race circuit to encourage participation in local competition, which includes 15 races in the greater Chicago area. To participate in the circuit, athletes must run at least 5 of the 15 races, and their 8 best performances are counted in the score for the year. Fleet Feet Sports’ James Akita won the 2017 circuit overall for men (making that the third time in four years), and Columba Montes won the 2017 circuit overall for women. Angelica Guerrero won the 2017 circuit in her age group for the 6th year in a row! So, if you stop in the store for one of our fun runs, and someone takes off at an alarming pace, it’s likely one of our elite team members. These results only scratch the surface of our team’s accomplishments in 2017, and we can’t wait to see what 2018 will bring.